We hear you. We see you. We are you. It’s not always easy to get started doing something new. For some reason we think it should be, but in reality it shouldn’t be! Anything worth doing will create hesitancy, doubt, and uneasiness in your mind. It means you’re going in the right direction — that you’re growing, changing, transforming! This is EXACTLY why you should take the leap. 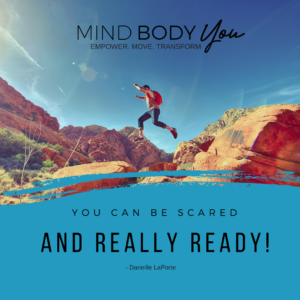 Whether it’s starting a Mind Body You 6 Week Program, the Momentum Series, a Yoga Class, Personal Training or Empowerment Coaching or ANYTHING you want for yourself, it’s time to follow your heart. Create what you want for yourself. We’ll be right there with you! LET’S DO THIS! If you want to learn more about going all in and committing to yourself, set up your FREE 30-minute power-session!